I promised to post this yesterday, but never got to it. Still there is nothing that warms my soul more on a cold day. A good motto - Chili when it's chilly. Heat a 10 qt stock pot or Dutch oven on high heat. Begin adding chili meat a little at a time, so as to not cool the pot down, once all of the ground meat is in add the trinity (onions, celery, and green pepper) when onions are translucent stir in the searing seasonings followed by the stew meat, stir again. When all of the meat is well seared reduce heat. Drain off half the fat. Add all diced tomatoes and 32 ounces of the water. Stir well, bring to slow boil. Stir in Dry Ingredients and chopped garlic. For a medium spicy chili only add half of the cayenne pepper, For spicier add all of it. NOTE: Don't be scared of the chili powder, it's not hot with spice, but your chili will be bland if you don't use enough. The longer the chili sits, such as over night, the better it gets. Add beef stock (or beer) to pot and stir in well. If needed, add the rest of water. Bring back to slow simmer. Reduce heat to low, cover and simmer 1.5 hours, stirring occasionally. If adding canned beans do so during the last half hour of cooking so they don't get mushy. NOTE: If thicker than you like, add more water. If too thin, whisk a couple tablespoons of masa flour with 1/4 cup warm water and stir the mixture in slowly until desired thickness is obtained. 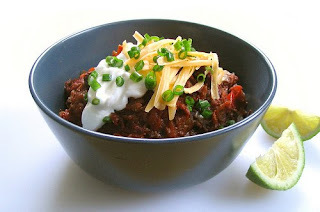 Ladle up a bowl of chili and pile on toppings of your choice. Note: I use this recipe with the heat kicked up quite a bit by doubling the cayenne. It takes a real chili head to enjoy it. I refer to that variation is Esau's revenge an allusion to the biblical reference to Esau having traded his inheritance for a bowl of soup or stew. In much of the world, where refrigeration is limited or nonexistent, a container of pottage is kept on the fire to keep bacteria from growing in it. New food is added to the pot as it is brought in resulting in a consistently changing hunters stew. This is probably what Esau was eating. As hot peppers have been introduced to the local culture they have frequently been incorporated into this stew pot resulting in some version of chili.